P.A.T.H.S. is Matt's treatise on the subject of progressive anagrams. 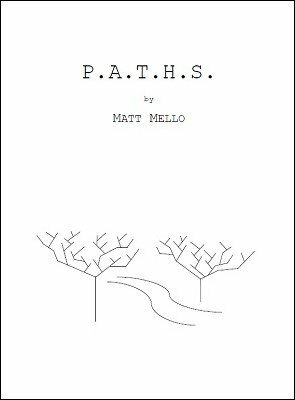 This manuscript contains all of Matt's best work regarding this classic concept, featuring new, in-depth systems to deceptively employ these techniques in the real world. There are three specific 'paths' that are covered, each providing a logical approach to hide the process of progressing through an anagram. The main focus of this ebook is on presentation, but there are also many unique anagrams and fresh concepts which are outlined. There are anagrams for Nintendo characters, months, and star signs. There are even new anagram designs that mix multiple categories together, creating the illusion of endless choices! "Alphagram" will be the highlight of the ebook for many, and for good reason. This is a practical method and presentation to perform a progressive anagram on the English alphabet, learning any random letter that a spectator thinks of! The participant can think of ANY short word or name, and we can deceptively guess it using the "Alphagram" system. With brand new thoughts on structuring and presenting anagrams, P.A.T.H.S. is likely to become a must-read ebook for any serious mentalist looking to study this subject. If you've ever felt that progressive anagrams weren't deceptive enough, this may just be the work that converts you, and gets you started along the right path. 1st edition 2017, 53 pages.